Eleven members of the Christians in Action (CIA) group in Exeter spent Saturday, May 5th serving the Exeter area for their Community Clean up day. They picked up trash and sticks at two area parks and also helped two community members clean their flower beds. 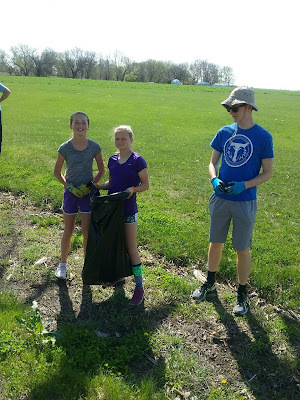 Above– From the left, Malorie Staskal, Jozie Kanode and Patrick Murphy were part of the crew who picked up trash at the park. Below – Planting flowers at the park in Exeter are members of the Christians in Action group. 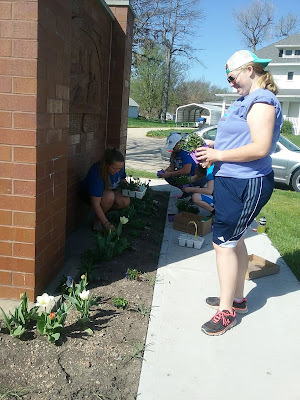 During their Community Clean Up day Katie Mounce (far left), Alexis Uldrich (far right) along with Caitlin Murphy and Kayla Bonds (hidden) beautified the area around the Gilbert’s Park sign.